I am always curious as to why people view the label “feminist” as a strange thing. I can understand hating the fact that there needs to be a term for it and that people do not just naturally embrace equality. 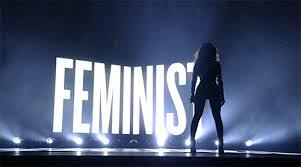 What I don’t understand is how being a feminist has come to be almost taboo. I don’t understand why it is often used as an insulting term to hurl at someone (“feminazi” has to be my favorite though). The way I see it is you either A. believe in equality of the sexes, thus making you a feminist or B. you are either indifferent towards equality of the sexes or flat out sexist. You’re either racist or not, homophobic or not, sexist or not. I find it even more frustrating when women (especially well-known women) come out and blatantly state that they do not consider themselves feminists. It’s a slap in the face for all of the hardships that those feminists before us have been through in order to get where we are today, and it’s a slap in the face for modern feminists striving for more progress. The Courier Journal had a great article on the response that female celebrities had to the question “Are you a feminist?”. It also mentioned the powerful definition of feminism Emma Watson gave in her United Nations speech where she quotes lyrics from Beyonce’s song “flawless”.